Blue Hair Grass (Koeleria glauca) - Blue Hair grass seed produce both the foliage and flowers that are attractive and enhancing to the landscape, and it is one of the few low-growing ornamental grasses. 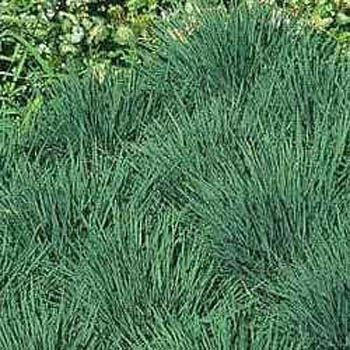 This ornamental grass will only grow to 12 inch tall, producing dense tufts of blue-green leaves. Blue Hair grass is a well-behaved and non-spreading species that is suitable for sunny borders. It forms a low mound of very fine blue-green leaves with a hedgehog appearance. In the spring, flower panicles emerge that are glossy green, and they mature into tan seed heads by midsummer and last through late summer. The flowers preserve well and can be used in dried arrangements. The Blue Hair plant may remain evergreen in mild winter regions. Blue Hair Grass care includes a hard trimming in late winter down to 2 inches to remove dead foliage. In the fall, the flower spikes can be removed to neaten the appearnace of the ornamental grass plant. Can divide in spring or fall. Blue Hair grass grows easily in average, dry to medium, well-drained soil in full sun. It performs the best in lean soils and will not do as well in rich, fertile soil. Koeleria glauca Blue Hair grass is drought tolerant, but it is not tolerant of heavy clay soils, wet soils and shade.